Are you one of the 84% of supply chain professionals who say lack of visibility is their biggest challenge? Do you need to cut through data noise to get relevant insights, so you can act faster and with confidence? 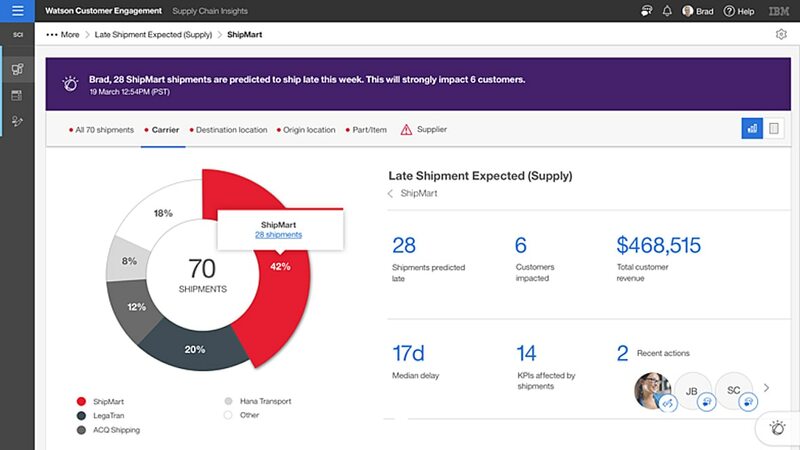 With Watson Supply Chain Insights, enabled by AI, you can predict, quickly assess and more effectively mitigate disruptions to optimize your supply chain decision making and performance. Gain end-to-end visibility across systems and partners and optimize collaboration to align supply chain operations to customer needs — drive up to 95% efficiency when tackling recurring challenges. Proactively predict, assess and mitigate disruptions and risks to enable a more resilient supply chain and safeguard your brand — reducing disruption mitigation time from days to minutes. Use data-driven insights that uncover savings opportunities you couldn’t see before to increase efficiencies and reduce costs — improving productivity by reducing information retrieval time by 90%.